A day of blustery, mixed weather in late spring, a child off school for the day and no idea what to do to kill time. 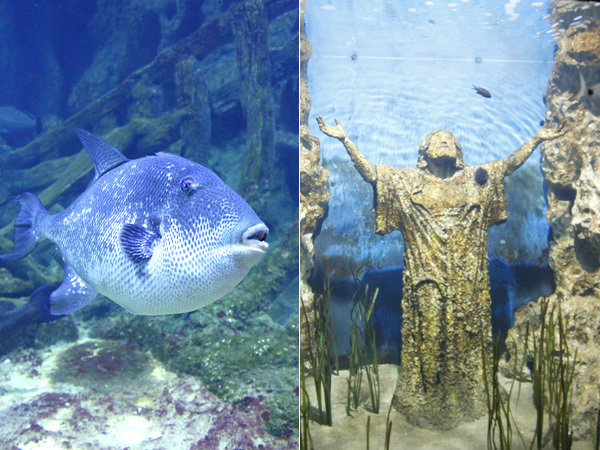 How about Malta’s National Aquarium, which opened last year but which I’d not had time to visit over winter? It seemed the ideal place to head to for some semi-educative time with a pre-teen in tow. I remember a friend commenting, when the complex was still a building site behind hoardings, that the aquarium, part-financed with EU cash, was merely an excuse for the adjacent and accompanying beach (‘reef’) club. So it was with some reservations that I decided to visit. While TripAdvisor reviews for the Cafe del Mar reef club were mixed, those for the aquarium were more encouraging though. I’ve visited aquariums in the UK (Southsea, near Portsmouth) and in the States, though am not a fan of the large ones with killer whale and dolphin shows. Qawra’s aquarium, national or not in scale, was clearly going to be a smaller affair, but as it does quite a bit to portray its educational and research aspects, I knew it would have something else to offer the visitor than mere size. Approaching from the Bugibba direction after a stomp along the seafront, the ‘starfish’ shaped canopy comes into view. It’s an impressive start. The building speaks professionalism and care (and of well-spent EU funds?!). Two men were scaling the canopy’s heights, doing maintenance. Design-wise, the National Aquarium is all there. 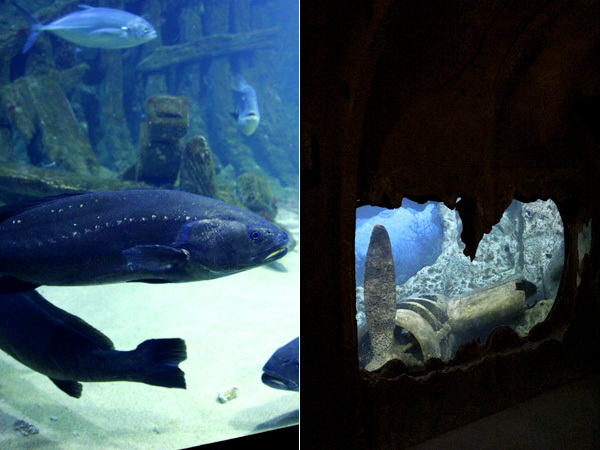 On entering, we saw some deep-bodied fish – probably groupers – in a large tank near the visitor reception. In fact, this particular tank did overshadow some we saw later on inside. The entry price is steep at Euro 12.90 for 13 years plus. Pricey tickets are par for the course for aquarium though. Having forked out for this visit, I was determined to make our stay last, and so we went round very slowly, reading all the info accompanying the tanks, and watching the looping film through one and a half times. Some TripAdvisor reviewers said there was little to see, and that going round takes a bare hour. True, you can look at it like this. However, even if not all tanks are memorable, others are worth peering into time and again as you’ll discover that what you thought was backdrop on first inspection, suddenly starts moving! The tunnel walkthrough with shark and rays in constant motion above and around you is one kids of all ages will enjoy. But equally as fascinating is trying to spot the weeny (rare and endangered in the wild) seahorses in their tubular tank. There are fish we meet at the fish market and mongers, and eat; and others we never come eye to eye with like the eels lurking menacingly in their holes, mouths a gaping. You can play ‘Finding Nemo’ and take some half decent photos of the very slow moving groupers when you’ve failed to capture the fast-moving sharks. The tanks seem clean and well cared for and the fish appear to have enough living space. What I particularly enjoyed were the themed tanks which used underwater backdrops you’d find in Malta, such as wrecks of wartime planes, or the recreation of a portion of Grand Harbour and a scene from a Roman wreck with amphorae strewn around. This is, as its name says, a Maltese and therefore local sea experience, so we discovered quite a lot about the ecosystem of our part of the Mediterranean that we only half knew. The looping film is well made and the voice-over informative; it’s well worth a 10-minute stop to view as it helps you interpret the tanks where the written info is missing. My main criticisms are about the lack of accompanying written info next to the tanks. We found the ring-binders with laminated cards were ripped and already showing signs of wear. A permanent wall plaque would be better as it doesn’t take many school parties to ruin flimsy ring binders. Some tanks didn’t seem to have any accompanying info so we were at a loss about the fish inside. As the walk through is in very dim lighting, you can’t easily read a lot of the info so the film is a necessity! The other issue I have is that the Aquarium didn’t seem to show what its research arm is up to, so one is left feeling that it might be a bit of an adjunct, even if well run, for the beach club next door. The film talks of conservation challenges, but I’d like to have understand exactly what the National Aquarium’s role is, with some hard and fast examples of conservation in action. Then again, I might have missed the explique’ in the dark. Worth a visit but do try to linger and read / see everything to ensure you make your stay last longer than an hour, and you can justify the entry price. Kids to pre- or early teen will enjoy it, but try to make up your own quiz on the way around. Not much provided for individual kids by way of activities (perhaps more on offer if you’re with a school group). We’d visit again in a year if there are more fish to view or there’s a special event or activity day. It’s definitely worth a trip if you’re here as a visitor and have bored kids or want a change from the beach. We didn’t stop at the ‘La Nave’ bistro-restaurant afterwards having felt the pinch of the entrance ticket price, but again, it had great decor; reviews seem to show it has reasonable food on offer too. 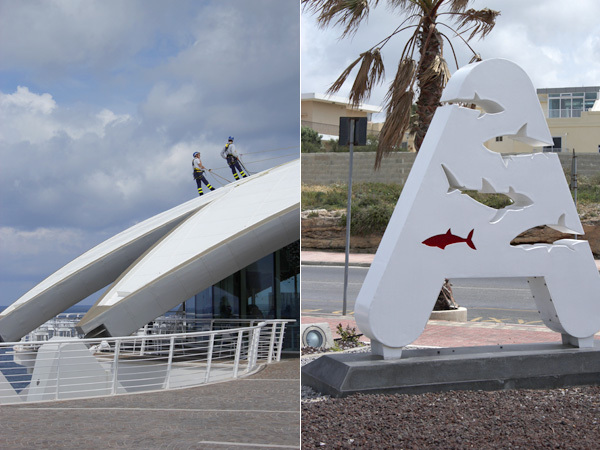 Overall, Malta’s National Aquarium is a good initiative and is becoming a venue for local environmental activities including various marine biology short courses and day events for kids. Its Facebook page has the latest events. We hope its educational and research arm will flourish as even we locals know little about the issues facing the sea that surrounds us! Tickets for the Malta National Aquarium can be bought at the door. Parking: we advise parking on adjacent streets for free, rather than the official carpark. @Ali, thanks for the update. Perhaps they came across my lament about the info! or they’ve updated the info after a busy year of school groups manhandling the flimsy plastic binders. Good to know they were aware of the problem. 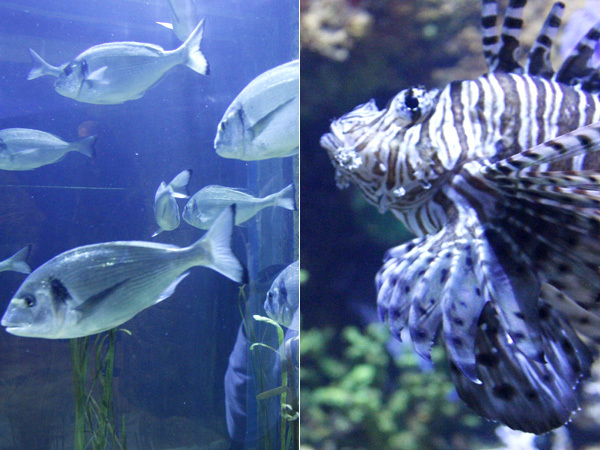 I have to say, I didn’t see any staff on hand while we were in the aquarium itself – just some on reception. In my very recent visit this week, they introduced new tablets with all the information about the fish. Now it is easier to read the information. However the helpful staff was willing to inform us with all the information about the fish and the environment of the aquarium which made the visit very unique and fun. Thanks Antonio for this considered and informative review, which adds even more weight to my criticisms about the place not having requisite info. Perhaps because the habitats, as you mention, are actually alien to the species within many tanks. I too feel that an opportunity has been lost here somewhere in amongst the beach lido, club and restaurant thrust of the place. My greater criticism would be the complete lack of what is the back bone of a marine environment. Real living habitats. Coral fish without corals. Clown fish without anemones. Habitats made of fiberglass or plastic with no life rocks and the abundance of bio diversity these hold. The bland backgrounds bereft of any attempt to recreate these habitats. I have visited aquariums before, but none showed such a disregard to the importance of habitats. How can one appreciate a clown fish who’s whole life revolves around anemones without providing anemones? 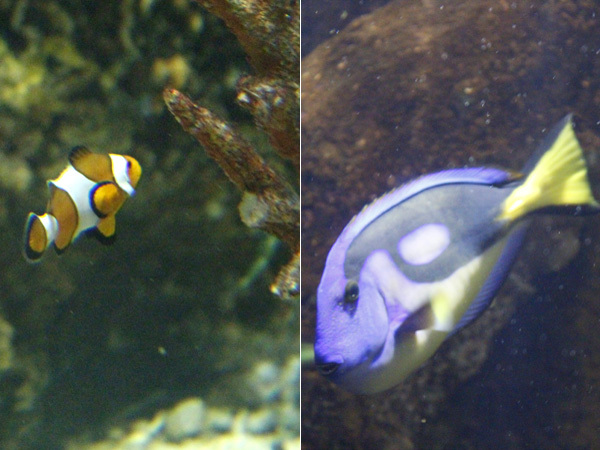 How can one appreciate the relation of reef fish to corals without corals, or cheap imitations of these? Any serious salt water aquarium enthusiast puts more effort in recreating the best possible environment then what was done here. What I find sad is that considering this was built with EU grants more consideration was given to the actual structure, the modern dome, clubs than to the actual fish habitats. 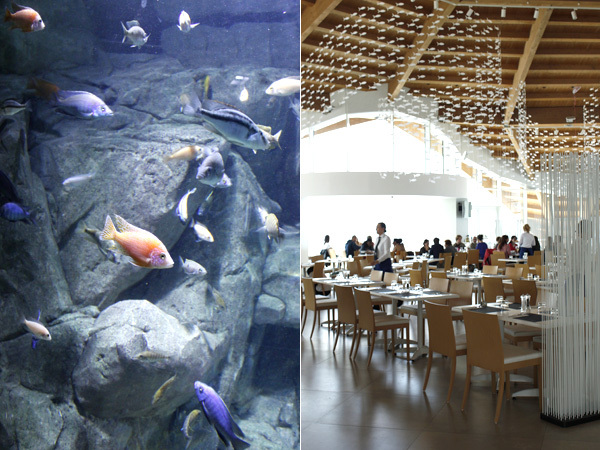 It is true that the site is being used for various activities, but the aquariums themselves contribute as much to educating regarding the marine environment as a dried book pressed flower educates its importance and relevance to bio diversity.